I worked VU2BK on 20 CW back in the late 70's or early 80's, sorry don't have the log. I was using an indoor 20 meter dipole antenna on the fourth floor of my condo in Evanston, Il. I'm lucky to remember the QSO. reading it for over a year now. 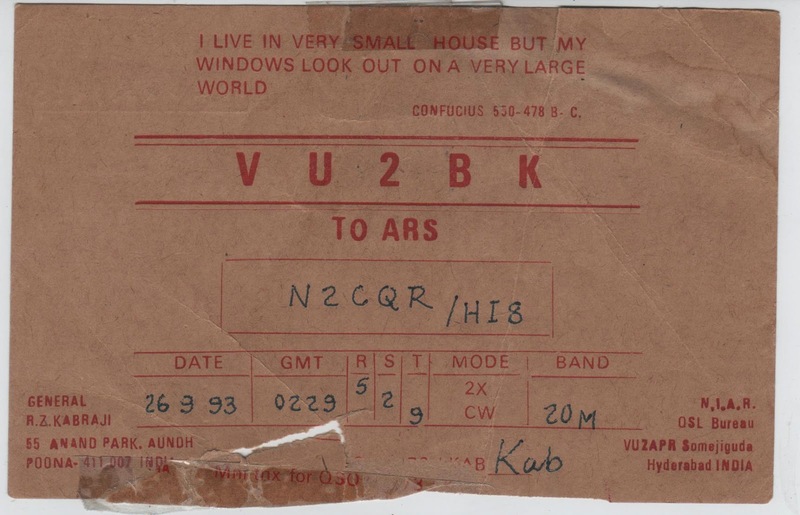 I had a few QSO's with Kab, VU2BK, on 15 M AM phone back in 1960. He was running 18 watts to a 1625 final, and my home-built rig used an 807 (60 watts input) modulated by p-p 1614's (a beefed-up 6L6). He has been a SK for some years now, but his son Zal (VU2DK) is very active and we have had several QSO's. I really enjoyed your book, and also your blog.